BREATHE: Breathing is the #1 primal need because we can only live approximately 5 minutes without oxygen. Control your breath and you can control your life. You can slow life down by simply slowing the rate at which you breathe. Try this grounding and breathing technique: Perform 2 minutes of diaphragmatic breathing while standing and connecting to ground. Stand with feet shoulder width, lengthened spine with right hand on belly and left hand on chest. Imagine all 5 toes, ball of foot, outer foot, arch and heel have roots connected to ground with sandbags on top of feet. Feel strength and stability. Next imagine there is a steel band going around the waist under the belly button with a connection from band to the earth in the front and back anchoring to the ground. Breathe in and out of nose for approximately 15s each breath (5s inhale (belly falls and rib cage expands as much as possible) > 5 s hold > 5 s exhale. Close mouth. Breathe into entire body. Work on 360 degree expansion of the torso, especially the back. While breathing, think about 3 things you are grateful for and then what 3 things you are going to do today or tomorrow to achieve your goals. Prayer while breathing is another option. Consider trying the Chakra Tuner App by Jonathan Goldman and the Brain Sync App for meditation. Work on breathing everywhere and anywhere: before bed, upon waking, red lights, during exercise, before eating given it is our number one need. We can change our physiological state in seconds via breathing. If we master breathing, we can enjoy life at its fullest. Inverted or chest breathing sympathetic dominance (flight/fight response) leads to digestive complaints, neck issues, TMJ, grinding of teeth, anxiety, scarcity, belly fat and more. 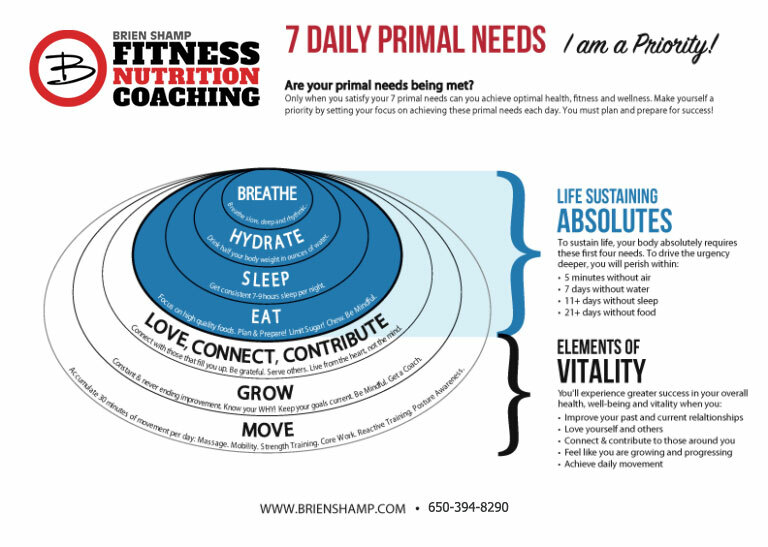 HYDRATE: Hydration is the #2 primal need because we can only live approximately 7 days without water. Start your day with 16 oz. of water (add lemon juice in water if you like). Drink 8-16 oz. of water before and one hour after each meal. Your goal for the day is to accumulate ½ your body weight in oz. of quality water. Drink another 4 oz. with each minute exercise session. Use filtered water for drinking and showering. Consider using Aquasauna. Avoid keeping your water in plastic containers. SLEEP: Sleep is the #3 primal need because our body fails in less than 21 days without it. EAT: Food is the #4 need because we can only live 21 days without it. GROW: Know your WHY! Keep your goals current. Be mindful of all interactions. Ask, where is the gift in this? Get a coach. Control your mornings by making YOU a priority before anything else. Focus on your agenda and avoid technology to avoid distractions. Wake up 30 minutes before others to make this happen “Magic Time.” Consider a daily meditation/reflection/prayer practice and process. Be mindful of your language to both yourself and others. Strive for Constant and Never Ending Improvement (CANI) and focus on your mindset! Your mindset is the gateway to Love & Happiness. Love & Happiness will allow you to continue to make YOU the #1 priority! Check out these personal development resources: Recharge That Passion *Spend at least 30 minutes per day on your mindset! If you are too sore, perform the foam roll routine, stretch as much as you need and take a walk. More is not necessarily better. Exercise is only one part of the fat loss and health improvement equation… even smaller than sleep and food!